PR Newswire: Omnivision reports financial results for the fiscal second quarter 2011 ended October 31, 2010. Revenues for the quarter were $239.5M, as compared to $193.1M in the previous quarter, and $183.3M a year ago. GAAP net income for the last quarter was $28.9M, as compared to $16.9M in the previous quarter, and $8.1M a year ago. Gross margin for the last quarter was 28.2% as compared to 26.9% for the previous quarter and 24.0% a year ago. The sequential increase in the gross margin reflected a continuing yield improvement in the company's BSI products. Omnivision ended the period with cash, cash equivalents and short-term investments totaling $396.7M, an increase of $47.7M from the previous quarter. Based on current trends, the company expects next quarter revenues will be in the range of $230M to $250M. Globes: Broadcom acquired Israeli image processing company SightIC Vista. The acquisition was reportedly for $10-20 million - below the threshold requiring notification. SightIC president and CEO Noam Sorek, VP product management Ron Fridental, and VP R&D Dr. Ilia Vitsnudel founded the company in 2001. The three specialists in video and imaging processing had worked together for a decade before co-founding the company. SightIC products include stand-alone video ISP and ISP IP blocks for licensing. Other than generic ISP pipeline, the company developed improved digital zooming and stills and video stabilization IP. SightIC has customers from among the world's top electronics manufacturers, including Samsung and LG. Relatively little was invested in the company by private investors, with no involvement by venture capital funds. Bloomberg: Nokia, LG and "chipmakers including STMicroelectronics" were sued by the California Institute of Technology, which said the companies’ mobile phones and components infringe its patents. Caltech lists nine patents on camera technology that Nokia, LG and Pantech phones allegedly infringe. Also named in the Nov. 24 complaint were SETi, Siliconfile and Toshiba. The case is California Institute of Technology vs. STMicroelectronics, 10-9099, U.S. District Court, Central District of California (Los Angeles). 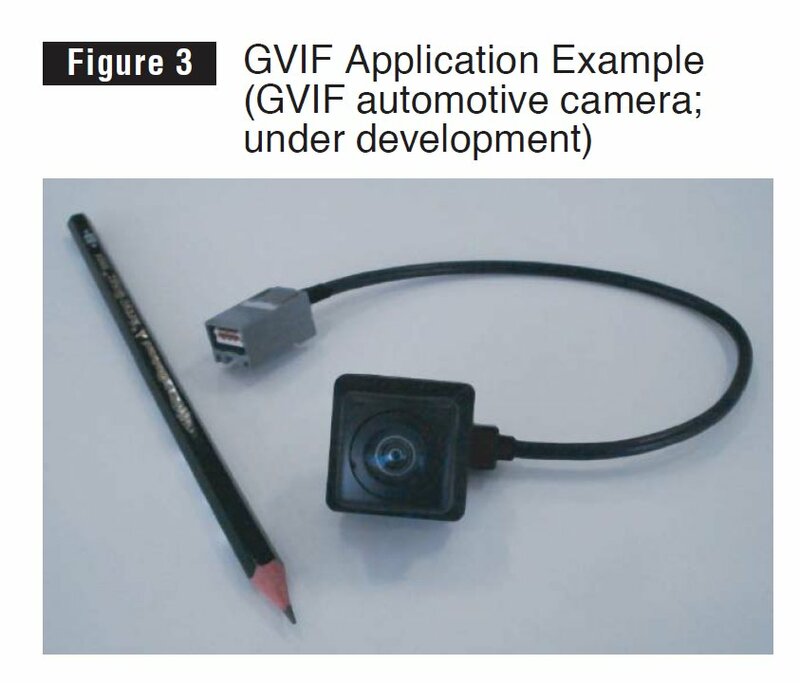 Two years ago Caltech sued few camera companies on CMOS sensor patents. Some of them settled the issue with Caltech, some others denied the infringement. Cx-News vol 62: Sony announced 2/3-inch 2.83MP ICX674ALG/AQG CCDs capable to deliver 1080p HD video in B&W and color versions. 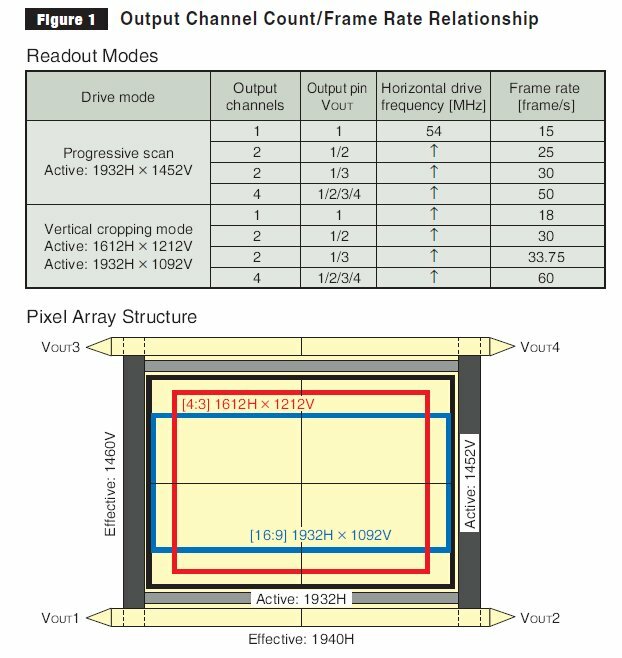 1/4-inch 1.4MP IMX076LQZ/CQZ CMOS sensors are targeting industrial applications and feature new high sensitivity 2.8um pixel (somehow Sony calls it "2.8um diagonal"). As a result of the improvements, Sony was able to acquire in 1/4-inch sensor sensitivity and SNR equivalent to the Sony's existing 1/3-inch 1.39MP CMOS sensors. The new sensors deliver 30 fps in 12-bit A/D conversion mode and 30 and 60 fps in 10-bit full resolution mode. IMX076LQZ is optimized for the long exit pupil distance while IMX076CQZ is developed for the short exit pupil distance. 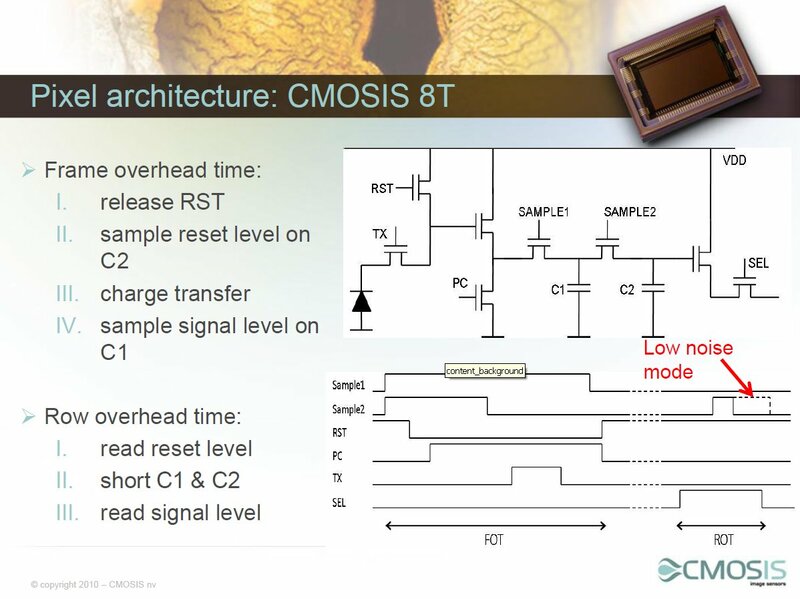 Interlace scanning in CCDs was/is always done in the charge domain, in CMOS this was done in the voltage or digital domain with extra loss of SNR. In the work of Xu, charge domain interlace scanning in CMOS imagers is realized for the first time, with the same SNR characteristics as with CCDs. Thanks to A.T. for letting me know! 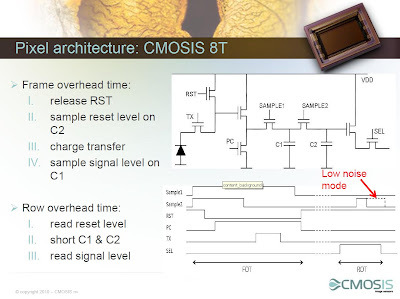 New Electronics: CMOSIS has demonstrated a 1MP image sensor featuring dual gain readout to reach DR of more than 89.5dB. The DR is increased by two approaches. First, the dark noise is said to be reduced. Second, the integration of the image charge is said to take place simultaneously at low and high amplification settings. This dual gain readout results in two different images which are read out sequentially and combined externally into one final image. The sensor has twice the number of column amplifiers than columns and the gain of each amplifier is programmable up to 16. This approach is to be used in a number of future products with different pixel size, frame rate, etc. 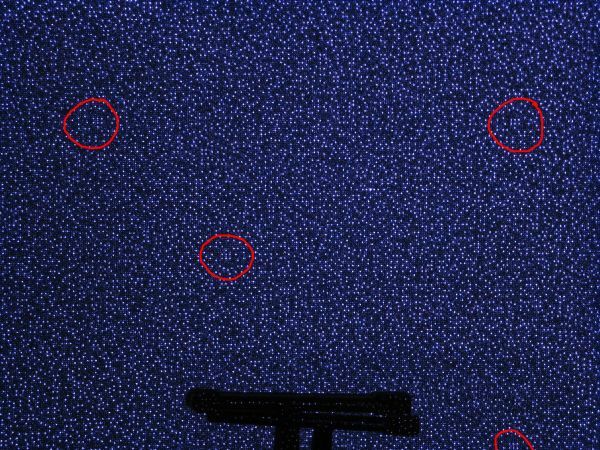 Update: Electronics Weekly too published an article about the new CMOSIS 1MP imager dubbed CLN1000 and featuring 10um pixels. The sensor consumes 300 to 350mW, and is housed in a JLCC-84 package. The article also states low dark noise of less than 3.4e- at a full well capacity of 100 ke-. EETimes quotes the same numbers too. Update #2: Photonics Online published an article about the CMOSIS prototype too. Update #3: Here is the original CMOSIS PR. A CMOS energy-harvesting and imaging (EHI) APS imager capable of 7.4fps video capture and 3.5μW power generation is designed, fabricated, and tested in 0.5μm CMOS. 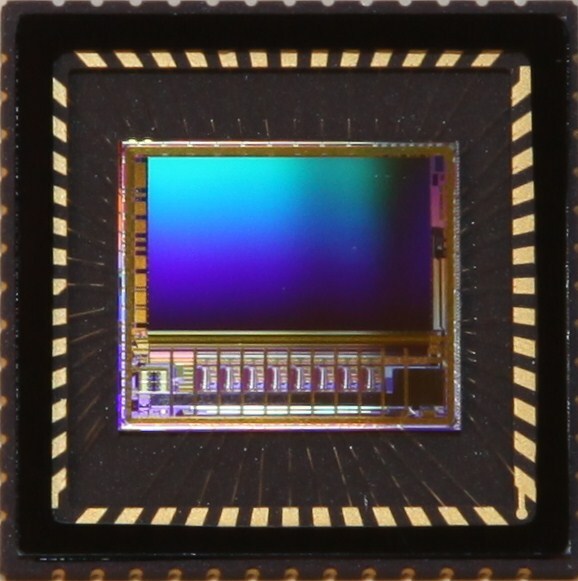 It has a 54×50 array of 21μm2 EHI pixels, 10b supply-boosted SAR-ADC and charge-pump circuits consuming 14.25μW from 1.2V resulting in a lowest power imager with 1.32pW/frame∙pixel. A 1Mpixel, 7.5μm pixel pitch, 0.18μm CMOS image sensor with column-parallel folding-integration and cyclic ADCs has 80μVrms (1.2e-) temporal noise, 82dB dynamic range using 64 samplings in the folding-integration ADC mode. Variable gray-scale resolution of 13b through 19b is obtained by changing the number of samplings for pixel outputs. A 256×256 pixel, 11μm pixel pitch, 0.18μm CMOS image sensor featuring pixel-level open-loop voltage amplification reaches a readout noise of 0.86e- and a dynamic range of 90dB in a single readout using a low-complexity readout circuit with 60fps. A reset method based on negative feedback allows the use of open-loop amplification while achieving PRNU of 2.5% and a peak linearity error of 1.7%. 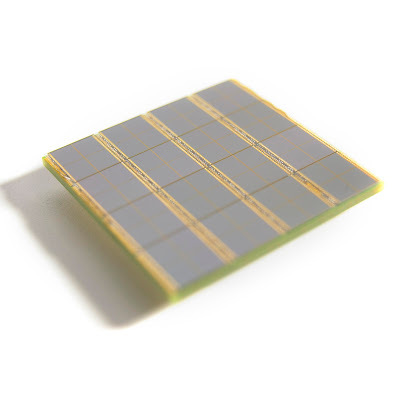 A 1.6Mpixel, 202×205mm2 CMOS image sensor on 300mm wafer consists of pixels of 160μm pitch with a 0-to-24dB variable gain in-pixel voltage amplifier. Reset and integrated signals are simultaneously read out from the pixel through a pair of column lines. It achieves a sensitivity of 25Me-/lux∙s, random noise of 13e-rms and operates at 100fps with global synchronous shutter. A 0.18μm 3D CMOS image sensor composed of angle-sensitive pixels captures both local incident angle and intensity. The 400×384 pixel array has a 7.5μm pitch and local diffraction gratings over each pixel. One such chip, using one lens and ambient light, enables post-capture refocus and range finding accurate to ±1.3cm at 50cm. This paper describes a 1/13-inch VGA SoC CMOS image sensor, with a 1.75μm pixel pitch capable of outputting 30fps at full resolution. The paper focuses on the sensor core, with a size of 1.77mm2 and a power consumption of 17mW. Thel pixel architecture uses a pixel-sharing scheme that improves low-light performance. 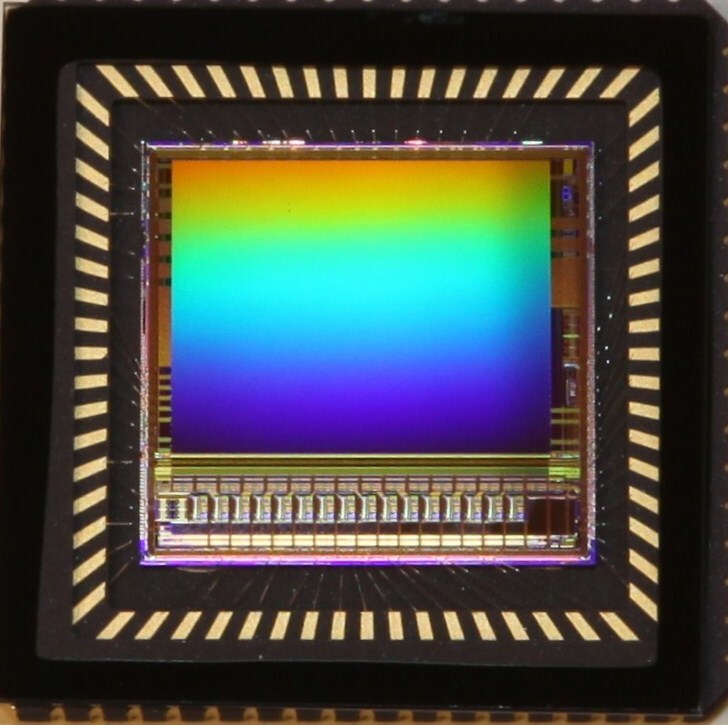 A 1/2.33-inch 14.6Mpixel CIS is developed by employing a 1.4μm BSI pixel with a floating diffusion boosting scheme driven by coupling with additional row-wise metal-line, achieving 30% higher QE than that of an FSI sensor, 87lux for SNR=10, and no image lag, for high-sensitivity and high-speed applications. 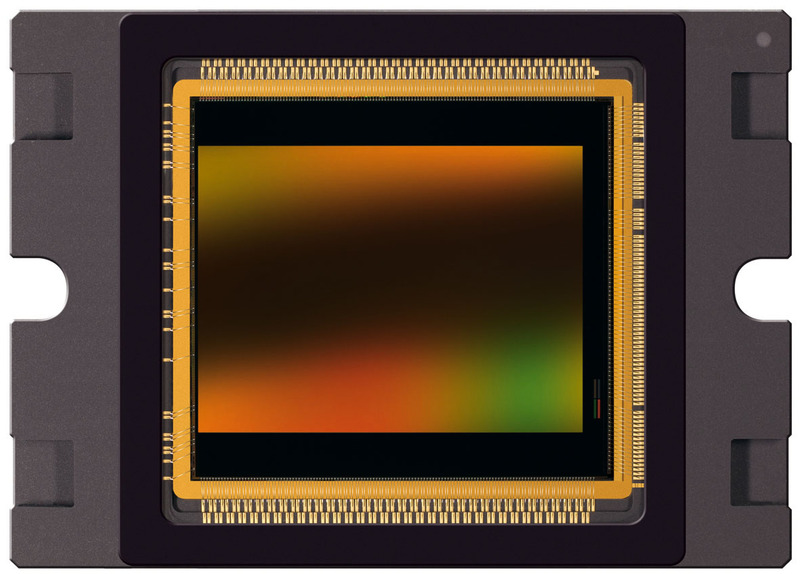 A 16M APS-C format CMOS image sensor with 14b SAR-ADC and 8-lane LVDS output is fabricated and characterized. A 4.78μm dynamic response pixel with ring gate transistors and no STI provides 62% QE, responsivity of 49.5ke-/lux∙s, and dark current of 17e-/s @ 60°C. The readout noise floor is 2.2e- with column FPN of 0.11e- in HCG mode. 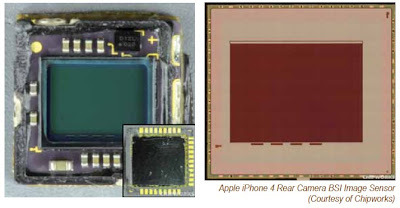 A 17.7Mpixel CMOS image sensor with a 27.5mm optical format realizes 120fps at 12b using 90nm CMOS. This sensor achieves 2.75e-rms random noise at 12b, 120fps with a maximum data rate of 34.8Gb/s. The 16 channels of scalable low-voltage signaling I/F with embedded clock operate at 2.376Gb/s each and the single-slope ADC ramp generator runs at 2.376GHz. 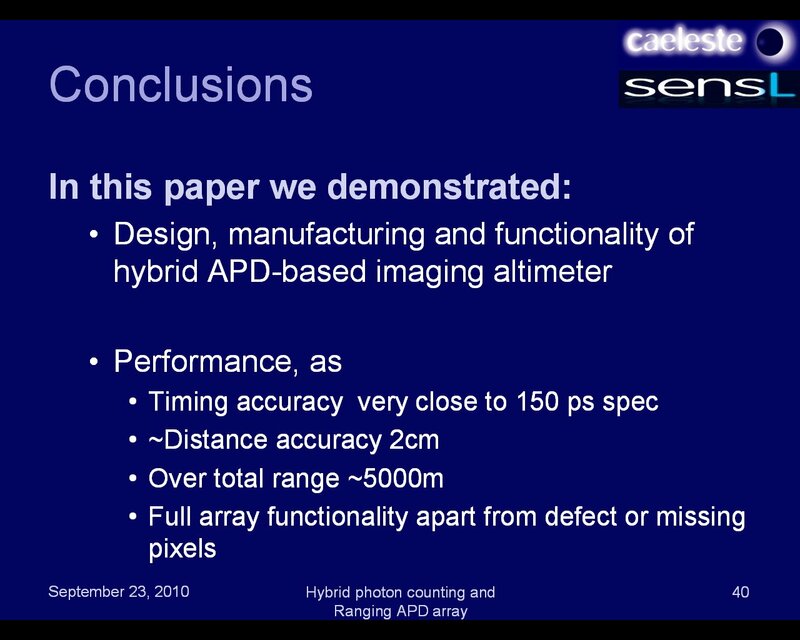 A 160×128 pixel array is presented detecting photons with 55ps time resolution. Each pixel comprises a counter, a time-to-digital converter, and a 10b memory, while a frame is read out every 20μs. The sensor is well suited for applications such as fast fluorescence lifetime imaging, optical rangefinding, and time-correlated single-photon counting. EON: Ambarella announces a complete 3D camera solution that includes the new S3D, a 3D video pre-processor. When combined with Ambarella’s A7 HD camera SoC, the S3D enables development of cameras up to 1080p60 resolution, while combining it with Ambarella’s A5s HD camera SoC enables resolutions of 1080p30, 1080i60 or 720p60. Both the A7 and A5s feature dual stream H.264 encoding, image stabilization with rolling shutter correction for CMOS sensors and wireless connectivity options. The S3D can accept input from CMOS sensors with MIPI, parallel, or SLVDS interfaces and supports runtime parallax adjustment and HDMI 1.4 3D information. The S3D and full 3D camera reference design kit with A7 or A5s SDK are available immediately. Newswire Today: Electronics.ca announces a new report titled "Image Sensors Market Report". According to the report, Asia Pacific region is the largest single region by sales with $3.3B projected for 2010 and average growth of 10% annually through 2015. 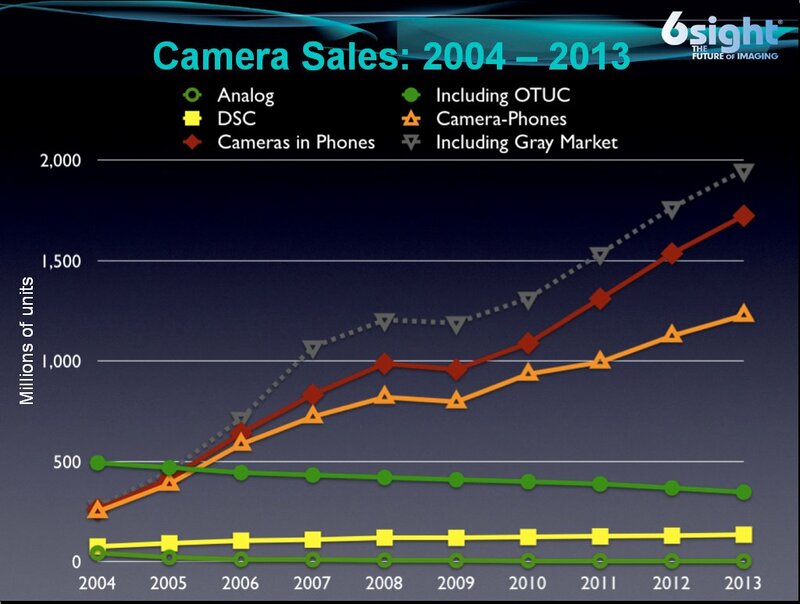 Korean and Taiwanese suppliers are gaining in market share, especially for camera phones. 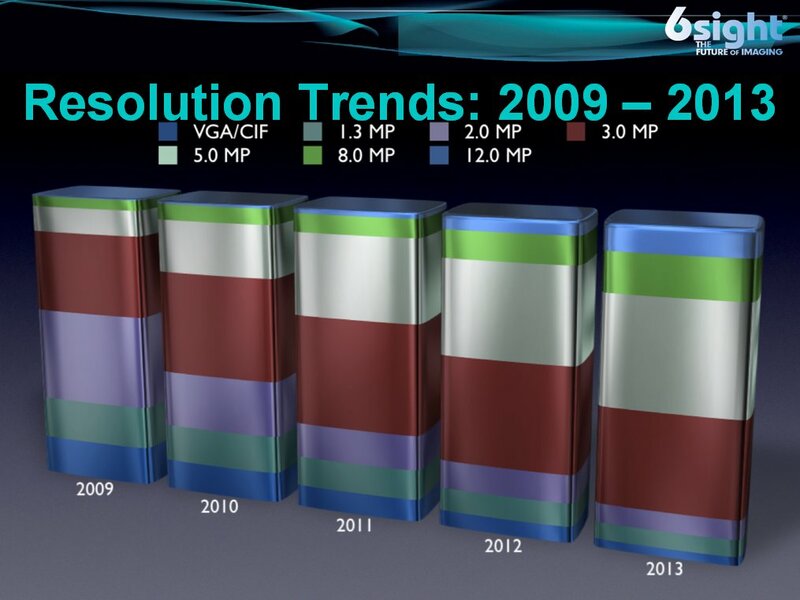 Japan has traditionally dominated image sensor production, and still manufactures over 90% of the world's CCDs. Japan will remain the second largest region for production with $2.2B in revenue expected for 2010. 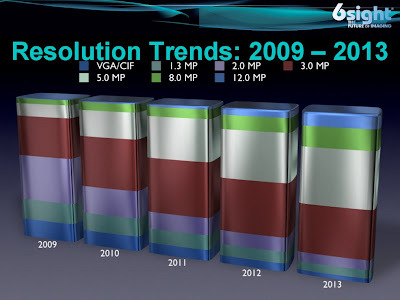 The Americas' share of the image sensor market has jumped from 3% in 2007 to over 12% in 2010. This jump is likely the result of some large image sensors supplier recording revenue for sales to a different region in 2007, and now recording it in the Americas region, either due to a relocation of manufacturing, or a reclassification in the region originally credited for the sale to better reflect where the products were actually shipped. Europe is currently the smallest region by sales with $416M in revenue and 6% of the total market projected for this year. Looking at the bigger picture, the whole optoelectronics market is $22.5B this year and is expected to reach $37B by 2015. Segments within this category include Image Sensors, Lamps, Displays, Couplers, Infrared Devices, Laser Pickups, Laser Transmitters, and Other Optoelectronics. Lamps (LEDs) constitute the majority share of the world's optoelectronics revenue with 33% share, followed by image sensors with 30% share. PR Newswire: Pixelplus announced financial results for the Q3 2010, which ended on September 30, 2010. The quarterly net income was $1.4M, compared to a net income of $600K in Q2 2010, and a net income of $150K in Q3 2009. The gross margin was 40.5%, compared to 33.6% in Q2 2010. The company's increase in gross margin was mainly due to its sales of high margin-driven products. The revenue for the quarter was $6.1M, compared to $6.0M in Q2 2010, and $3.1M in Q3 2009. "The key to our consistent growth and success will be our ability to transform our organization to achieve long-term profitability. For this aim, I believe our strategic and ongoing cost-control measures should help us decrease our cash requirements, concentrate on our core business, maintain our continuity, and improve the efficiency of our operations," said Dr. S.K. Lee, CEO and Founder of Pixelplus, "We continue to dedicate all of our efforts and energies on achieving our long-term growth targets and business strategies through developing new products, entering new markets, and securing new design wins." Vision Research unveils Phantom v341 - a high-speed camera tailored to military, scientific, research, and range applications. The v341 incorporates a 4MP/800fps 35mm format sensor with 3 gigapixels/second throughput. The custom-designed 2560 x 1600 pixel CMOS sensor featurs peak QE of 60%, global shutter speed down to 1us and Extreme Dynamic Range (EDR) mode with two different exposures within a single frame. Color and monochrome versions are available. Web Newswire: DALSA announced Xineos-1313-EO CMOS X-Ray detector panel designed to operate at full resolution frame-based panoramic dental imaging at frame rates exceeding 300 fps, as well Medium Field of View (MFOV) Cone Beam CT applications at 30 fps. The panel resolution is not clear from the announcement. Update: The open access Sensors journal published the Stanford University paper titled "Photo-Detectors for Time of Flight Positron Emission Tomography (ToF-PET)". The paper reviews recent advances in time of flight positron emission tomography (ToF-PET) based on two types of photo-detectors: photomultiplier tubes (PMTs) and silicon photo-multipliers (SiPMs) with a special focus on SiPMs. OptoIQ: In a paper to be presented on the upcoming IEDM a team led by the National Nano Device Laboratories (Hsinchu, Taiwan) will report an external QE of >80% for photodiodes in the visible range. The QE extension was achieved by harnessing a local surface plasmon resonance (LSPR) effect "due to self-accumulated local electric field in these corners" of a metal pattern on top of the photodiode. Each pattern has a period of 2.4µm and unit area of 1.44µm2. PR Newswire: Omnivision announced a start of mass production of the ultra-compact 1/10-inch OV6930 sensor with a packaged footprint of only 1.8 x 1.8 mm. It is targeted to serve a broad range of medical endoscopy applications, including bronchoscopy, colonoscopy, gastroscopy, OB/GYN and urology, and can facilitate development of medical devices that require an outside diameter under 2.6 mm. The OV6930 relies on OmniPixel3-HS pixel with low-light performance of 3300 mV/lux-sec and is capable of operating up to 30fps in 400 x 400 HVGA or 60 fps in 400 x 200 resolution. The sensor allows cabling up to 14 ft.
OmniVision also announced OV6930 design wins for two new medical device modules from Hong Kong based COMedia, Ltd. The OV6930 is now shipping in volume to multiple customers. Advasense is now offering low-noise image sensor IP blocks coming from its CIS technology. The ADVA004 CDS based Readout Pipeline is said to have the lowest temporal noise in the industry of 40uV. The design is compact and low power. The Readout (RO) Pipeline can be connected to any 4T pixel array. Conversion time is less than 2us. The ADC and CDS Readout are also offered as separate blocks ADVA002 and ADVA003 respectively. Advasense is already working with several companies and probably license them its IP. Thanks to A.G. for sending me the link! 80uV noise is an excellent number. However, 19db ADC seems to be an overkill for the stated DR of 82dB. Seems that many groups work on single-lens 3D cameras. 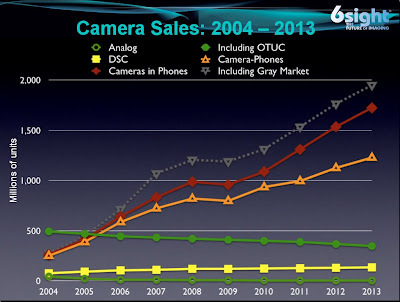 - Sony steadily increases speed of its sensors. 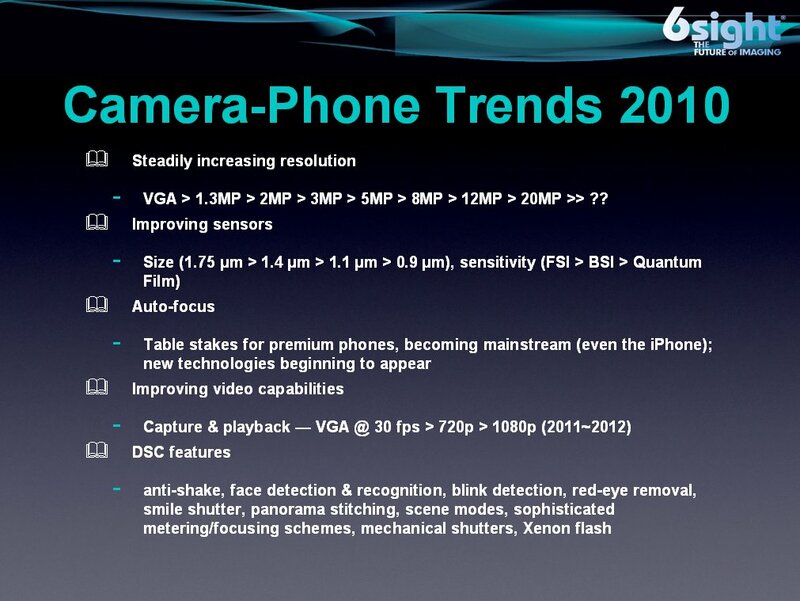 Just at this year ISSCC Sony presented 10MP/50fps sensor and now there is a new advance. 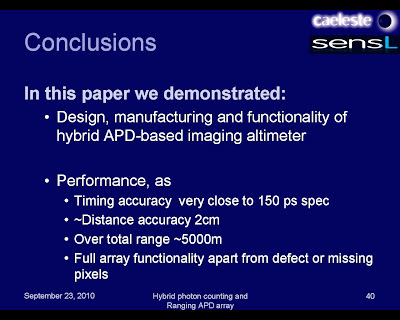 There is also a forum on "CMOS Image Sensors for 3D Capture" and Jed Hurwitz tutorial on "Layout — The Other Half of Nanometer Analog Design". Electronics Weekly: David Manners wrote a sentimental story about Kazuo Iwama, Sony's president in 1976-1982. 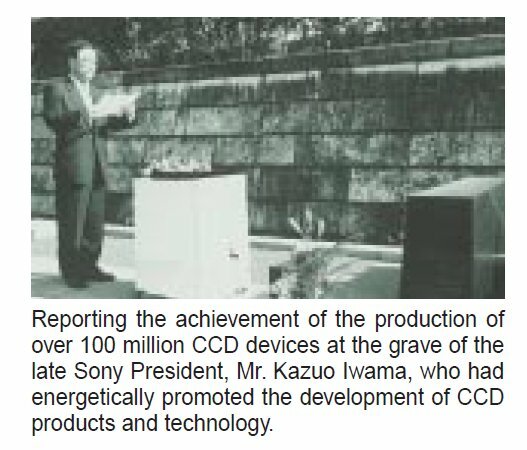 In 1973 as a deputy president he ordered Sony to start developing CCD for a consumer video camera. The development was much more difficult than anyone had imagined. The project dragged on, and on. At every board meeting Iwama was asked: "When are you going to get a return on the investment in CCD?" His invariable response was: "Maybe not while I'm alive." In 1985 Sony produced the first camcorder using a CCD and it was a huge success. Iwama had died in 1982. In Iwama's granite tombstone there is embedded a CCD. Sony CCD history is digested here. Tessera appointed John Keating as interim EVP of Imaging & Optics, reporting directly to Tessera's Chairman and CEO Henry Nothhaft. Keating has been with Tessera since 2003, and is the company's SVP of Corporate Development. He replaces Michael Bereziuk, who is leaving the company for personal reasons. OptoIQ published a popular review of camera module technologies: wafer-scale optics integration, multi-layer TSV integration inside module and traditional camera modules. EETimes quotes UBM TechInsights' reverse engineering of Microsoft Kinect revealing that of the roughly $56 BOM, about $17 is attributed to the cost of the PrimeSense 3D sensing reference system. Microsoft is planning to retail the Kinect system for $149, and stands to make a healthy profit on each unit, UBM TechInsights said. 17$ 3D system BOM is a tough target to meet for TOF camp. I've just discovered Imaging Exectutive Podcast site having many interesting talks, including ones from Sony, Marc Levoy from Stanford University, Invisage and others. The new podcasts appear once a week and might be a good time killer while commuting to/from work. The most recent podcast has an interview with Jess Lee, CEO of Invisage. Jess promises to deliver first sensor samples for mobile phone customers in few months and start production in 12 months from now. The sensor price is said to be competitive with FSI sensors and very competitive with BSI ones. Albert Theuwissen PTC Series goes on. The latest post talks about temporal noises with light on the sensor and its effects on PTC. SPIE article shows how human eye uses one of the recent developments in FSI pixels, the lightguide, to reduce its sensitivity to chromatic aberrations. Digitimes: PrimeSensor Technology, a joint venture of Pixart and UMC, has posted revenues of about $14.6M in the first three quarters of 2010. PrimeSensor also posted net profits of over $330K with a gross margin of 10-11% during the January-September period. Its mother company Pixart saw third-quarter 2010 revenues decline 17.7% sequentially. Pixart's fourth-quarter revenues could see another 30% sequential decrease, according to company chairman Huang Sen-huang. Pixart's gross margin is expected to slide to 42-43% in the fourth quarter due to declining shipments of high-margin gaming products, and the appreciation of the NT dollar. 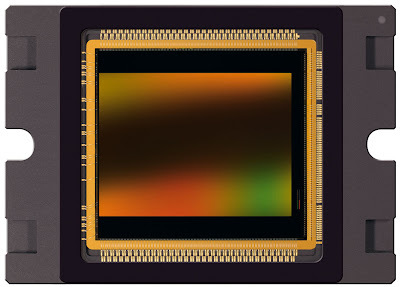 PR Newswire: Omnivision introduced the OV8820, a 1/3.2-inch 8MP RAW CMOS image sensor based on OmniVision's proven 1.4um OmniBSI pixel. The sensor delivers 1080p/30fps and 720p/60fps HD video with electronic image stabilization (EIS) and horizontal FOV designed specifically to meet the demands of smart phone markets (new Apple iPhone?). In full 8M (3264 x 2448) resolution, the OV8820 operates at 24fps in a 4:3 format and in 6MP (3264 x 1836) resolution at 30fps in a 16:9 format. A high-speed, 4-lane MIPI interface facilitates the required high data transfer rate. One of the features of the OV8820 is an integrated scaler, which enables EIS and maintains full FOV with improved S/N performance in 1080p HD video mode operating at 30 fps. Another feature is a 2 x 2 binning functionality with a post-binning re-sampling filter function that minimizes spatial artifacts and removes image artifacts around edges. The OV8820 has an on-chip VCM driver, temperature sensing, 256 bytes of OTP memory, lens shading correction and defect pixel correction. The OV8820 fits into the industry standard module size of 8.5 x 8.5 mm. The OV8820 is available for sampling now and is expected to enter mass production in March 2011. 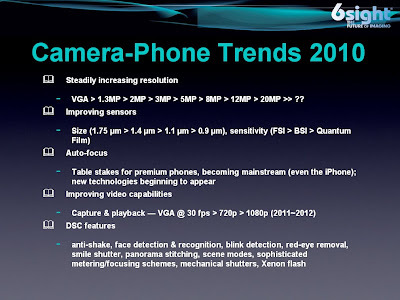 Industry research firm Yole Developpement is forecasting that 8MP sensors will hold over a third of the market share for camera phones by 2015.
Business Wire: Aptina announced MT9M024 automotive image sensor. The 1.2MP, 1/3-inch optical format sensor features high DR of greater than 115dB, , 720p/60fps HD video, full motion compensation and DR-Pix technology that enhances the performance of the pixel in very low light conditions. Aptina DR-Pix technology combines two modes of operation in one pixel design – low conversion gain mode for large charge handling capacity in bright scenes and a high conversion gain mode with increased sensitivity and low read noise for low-light scenes. The surround-view ready MT9M024 also targets automotive forward-facing solutions like lane departure warning (LDW) and traffic sign recognition (TSR). The AEC-Q100 qualified sensor comes in a 9x9mm iBGA package that meets -40C to +105C operating temperatures. The sensor offers additional features such as on-chip AE, statistics engine, context switching, temperature sensor, parallel and serial outputs and auto black level calibration. The MT9M024 is currently sampling and will be in production starting Q3 2011. Cypress announced two new sensors in VITA family: 2.3MP/92fps VITA 2000 and the 5.3MP/75fps VITA 5000 designed for machine vision, high-end security, 2D barcode and intelligent traffic applications. The new sensors offer pipelined and triggered global shutter modes and a conventional rolling shutter mode, 10-bit ADCs, with either parallel outputs or serialized outputs up to 620 Mbps. The VITA 2000 can provide output in two standard formats: HD (1920 x 1080), which is typically used in the security market; and 4:3 (1600 x 1200), popular in the machine vision market. The sensor array has a standard 2/3” optical format lens. It offers four LVDS channels. 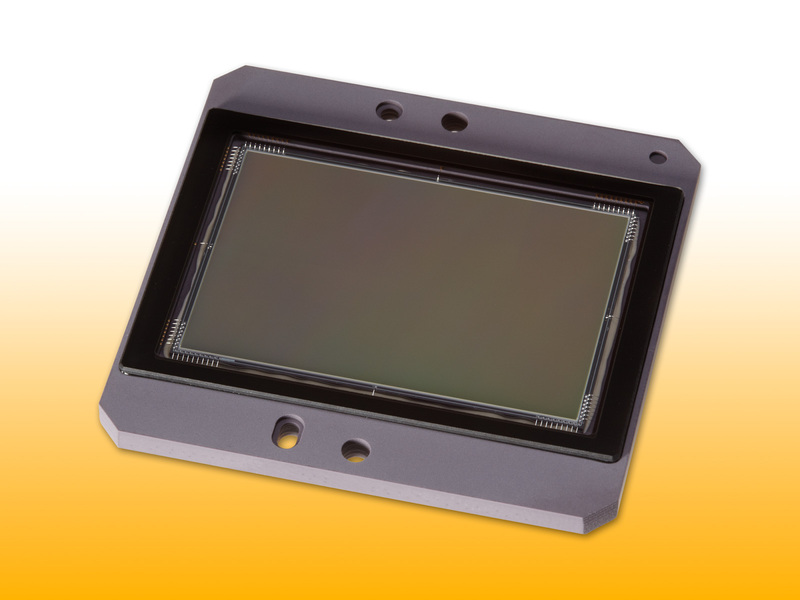 The VITA 5000 has a standard 1” optical format with monochrome or color digital output and offers eight LVDS channels. The new devices are manufactured by TowerJazz on its 0.18-micron CIS process. Cypress currently manufactures all of its image sensors with TowerJazz. “The new VITA 2000 and VITA 5000 showcase our state of the art image sensor technology, where our process and device features such as low dark current, low noise and high dynamic range enable the high performance required by the end users of Cypress’s imaging products,” said Jonathan Gendler, director of CIS marketing at TowerJazz. Thanks to D.S. for sending me the link! 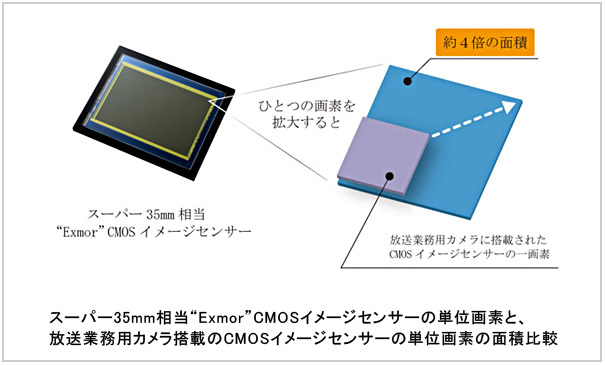 Sony has developed "Super 35mm equivalent" CMOS sensor for the professional Digital Cinema camcorder line. The "Super 35mm" array size is stated as 1.7-inch type, with diagonal of 27.1mm. The sensor is capable to deliver 1080p60 HD video and relies on column-parallel ADC architecture. Its pixel size is said to be 4 times bigger than that of DSLRs providing SNR of 63dB. This is the first time Sony's digital cinema line uses CMOS image sensor. The previous generations relied on CCDs. Arnaud Darmont, CEO of Aphesa, will be teaching 2-part High Dynamic Range imaging course at SPIE Electronic Imaging in January (part 1, part 2). Kodak announced KAI-29050 claimed to be the highest resolution CCD based on Interline Transfer technology. The 35mm optical format CCD is based on 5.5um pixels and features TRUESENSE W-RGB filter pattern to enhance low-light sensitivity. This 35mm format CCD is the 7th in Kodak's family 5.5um pixel devices, a family that includes an entire set of image sensors from 1 to 29 megapixels. The KAI-29050 joins two other products - the 720p format KAI-01150 and the 1080p format KAI-02150 - as the first devices to use the KODAK TRUESENSE Color Filter Pattern. The TRUESENSE technology is claimed to provide a 2x to 4x increase in light sensitivity compared to a standard Bayer color sensor by adding panchromatic pixels to the standard RGB elements that form the image sensor array. The KODAK KAI-29050 Image Sensor is sampling today in limited quantities, with production scheduled for mid-2011. The KODAK KAI-01050 and KAI-02050 Image Sensors are available today in PGA packages, with CLCC packages scheduled to be available Q1, 2011. Thanks to M.D. for sending me the info! Update: The new KAI-29050 is also available in a regular Bayer and monochrome versions. Thanks to M.D. for the correction! For those who believe in anonymous sources as a right information channel there is Glassdoor project collecting former and current employee opinions on their companies, and also job interview questions, salaries and such. Out of imaging companies, there are opinions on Aptina and Omnivision. Trust them or not. Electronics Weekly, BBC News: German firm Retina Implant reported testing results of the chip that has restored limited sight for people blinded by retinitis pigmentosa and similar diseases, destroying only the eye's photoreceptors, and leave its layers of image processing neurons intact. The chip, which is 3mm across and 50µm thick, has a 70µm pitch 40x40 photodiode array, plus a corresponding electrode array. The implant can both receive images focused by the eye's existing optical system, and inject signals directly into the original neurons. The chip includes signal conditioning, and has to receive power provided along a cable that exits through the side of the eyeball and is led to an inductively coupled power receiver under the skin near the subjects ear. The microchip yields a visual field of about 12°, allowing mobility and object recognition in space. Thanks to CDM for sending me this news! Update: EETimes reports that Retina Implant AG has opened a manufacturing plant to meet anticipated demand for its devices. The new manufacturing plant is 312 sq.m and located in Technology Park, Tubingen-Reutlingen, Germany. Of this, about 100 sq.m is for a clean room, with the capability to increase its size to 250 sq.m. The manufacturing capacity is estimated to be 1,500 sub-retinal implants per year and Retina Implant is planning to invest another 1.3M euros to equip the building. Retina Implant was founded in 2003 by Dr. Eberhart Zrenner and his colleagues in 2003, after extensive research with German university hospitals and institutes which began with a large grant from the German Federal Ministry of Research and Education in 1996. Retina Implant began implanting in human patients in 2005. Although the vision that results is relatively low resolution it allows mobility and some object recognition in space according to the company. There is the possibility of improving the resolution of implants in the future. 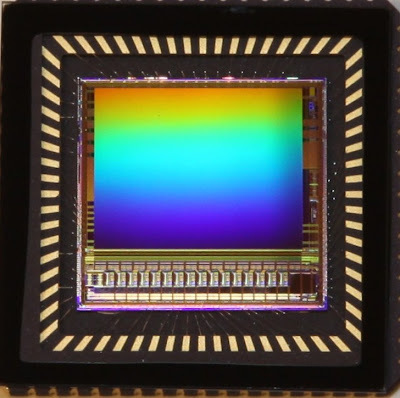 Philips announced a step forward in the development of its digital silicon photomultiplier technology by scaling it from a single-pixel sensor to a fully integrated 64-pixel sensor with a sensing surface of over 10 square centimeters and power consumption less than 1W. Capable of counting single photons and detecting their arrival time with an accuracy of around 60 picoseconds, Philips’ digital silicon photomultiplier technology eliminates the power-consuming A/D circuitry associated with existing analog silicon photomultipliers. Philips is looking for partners in selected applications to fully exploit the market potential of its new digital silicon photomultiplier technology. e2v PR: David Burt, Chief Engineer at e2v becomes visiting Professor at The Open University to recognise his contribution towards the training and research activities at The Open University, specifically within the e2v Centre for Electronic Imaging (CEI) based at the University’s Milton Keynes campus. The Centre, which was established in October 2008, is dedicated to the research and development of advanced technologies for scientific image sensors. One of the core goals of the CEI is also the training of PhD students in the development of detector technology and scientific applications using the technology to provide a source of highly qualified individuals into scientific, industrial and government disciplines. "I use my background in physics and fiber optics to suggest tests to the designers. For example, I may recommend testing using both pulsed and continuous light. Using pulsed light lets you see how long a device takes to respond. This kind of testing is important for sensors, because of possible "blooming." That is, if the response is too slow, residual signal from a sensor's response will add to that of the next sample, producing an error."